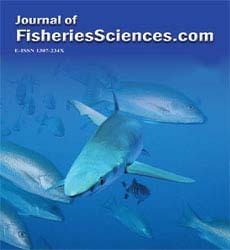 Seasonal variations of CPUE (Catch per unit effort) were investigated comparatively for catching whiting (Merlangius merlangus (Linnaeus, 1758)) by gillnets of mesh size of 32, 34 and 36 mm (stretched mesh) in the offshores of Fatsa-Medreseönü and Perşembe district of Ordu city and Piraziz district of Giresun city in the southeast coast of Black Sea in 2010. Average values of CPUE were found as 25.9, 16.7 and 20 g/m for Perşembe, Medreseönü and Piraziz stations, respectively. CPUEs obtained in the autumn being average 20 ºC water temperature in the three stations were higher than those of other seasons. Lowest CPUE was found in the summer period being average 25 ºC water temperature.